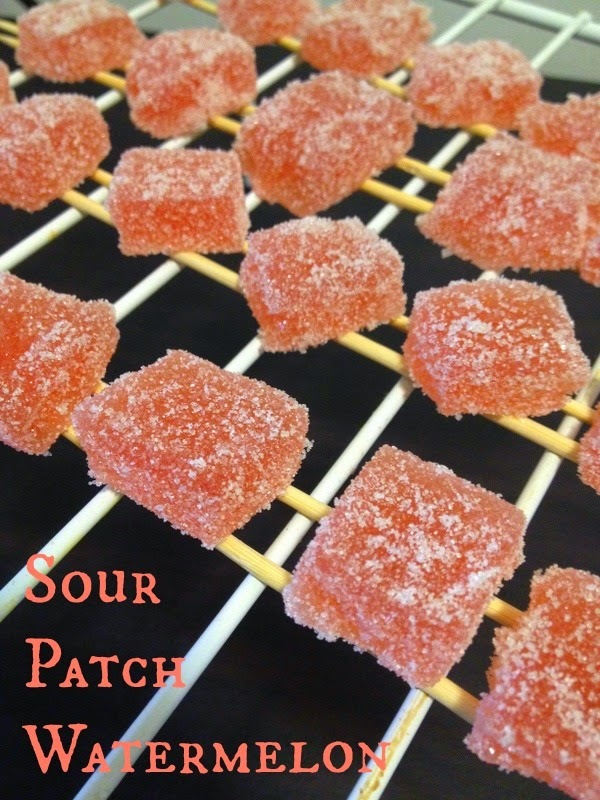 Sour Patch are soft and chewy candy with a coating of sour sugar. In my native, we call it as "Javvu muttai". This candy is one of my fav during my childhood days. Now my kid started liking it too. I made this sour patch with watermelon flavour. It is very easy to make and fun too. If you don't like watermelon, You can replace the fruit with your fav choice of fruits like stawberry, cherry, pomegranate. 1. Line the bread baking pan with parchment paper and set aside. 1. 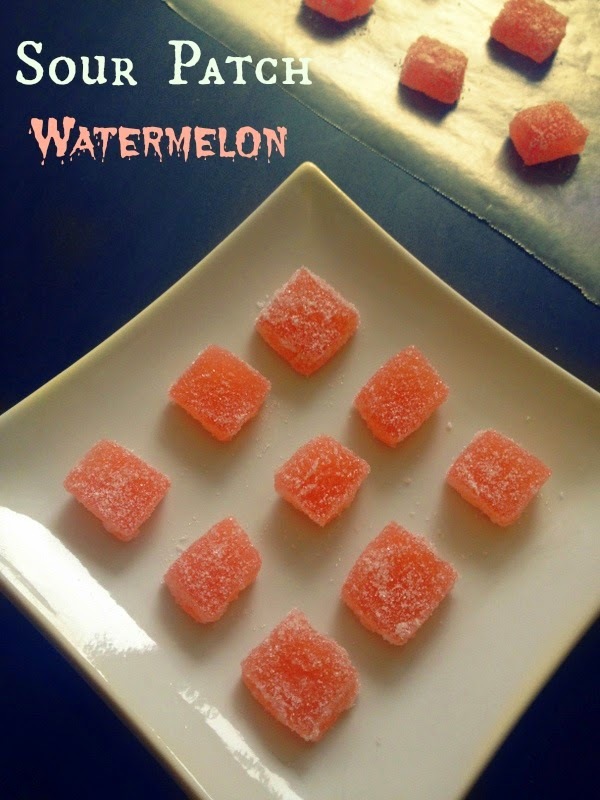 Cut the watermelon into small chunks and discard the rind. 2. Take the chunks in the blender and blend it smoothly. 3. Strain the juice using strainer. 1. 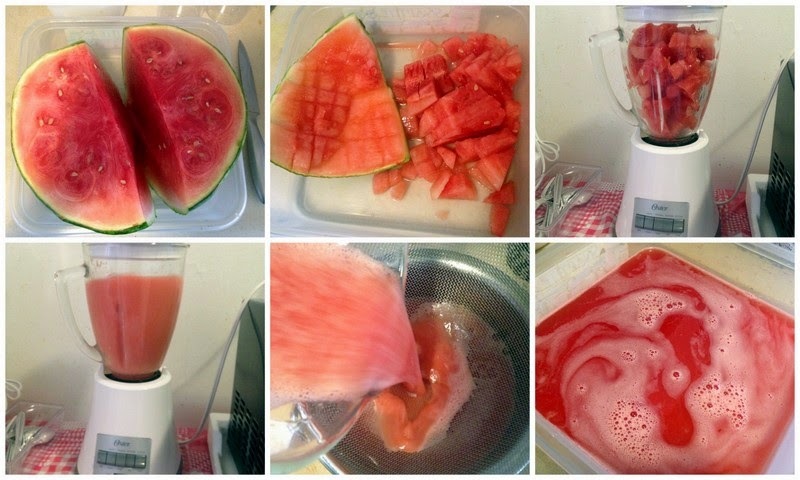 Take a cup of watermelon juice in a medium bowl, add half of the water in it. 2. Add citric acid in it and stir untill it completly dissolved. 1. Take sugar and water in a large saucepan. Bring it to boil over medium heat, uncovered, stirring until the sugar melts. 2. When the liquid starts to bubble, stop stirring and cook until it reaches 300 F in candy thermometer. 3. 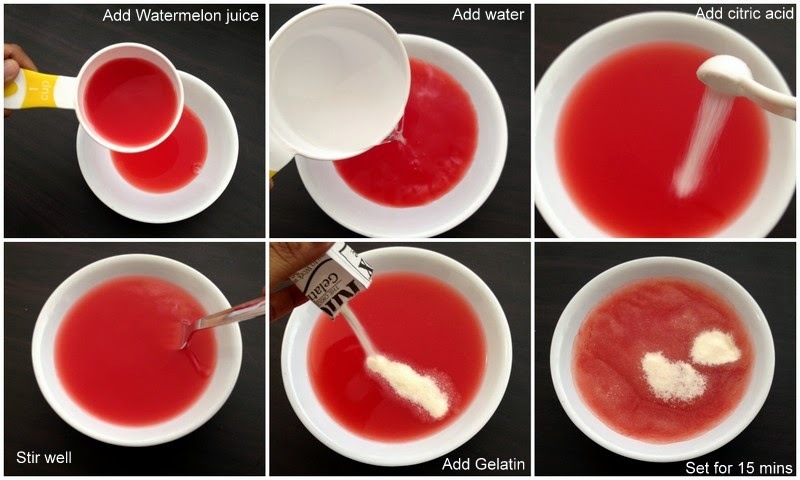 Take the gelatin mixture in another saucepan and pour the hot sugar syrup into the gelatin mixture. 5. Pour the hot mixture into the parchment lined bread baking pan and let it sit for 3 hours. 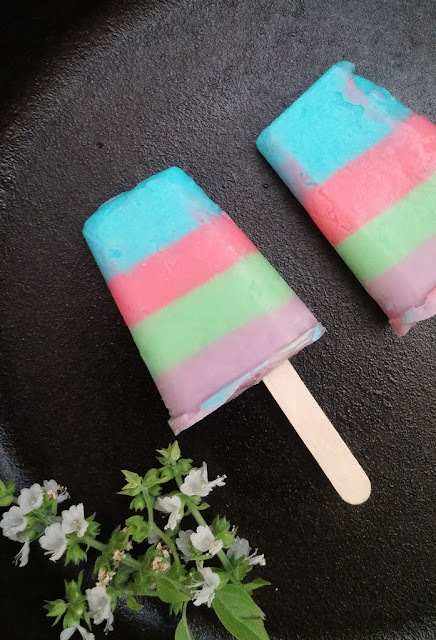 Slice it up and coat with sugar mixture! 1. For outer coating, take sugar and citric acid in a small bowl/plate. Whisk until it completely incorporate. 2. Place a parchment paper on smooth surface and sprinkle some sugar mixture on it. 3. 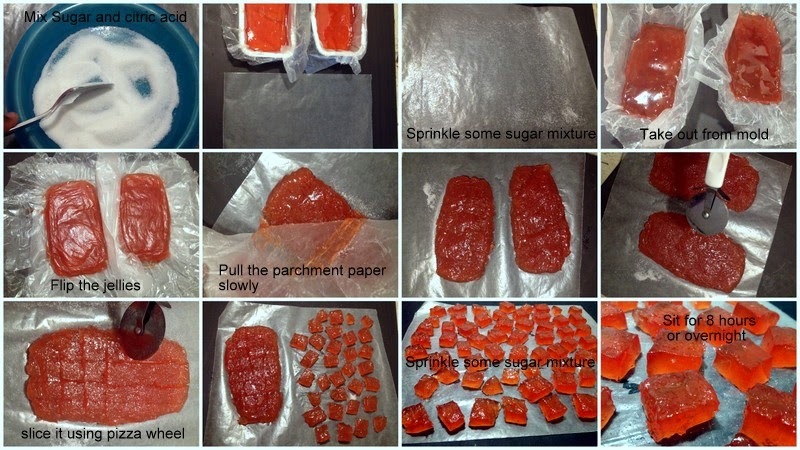 Unmold the gelatin block fron pan and flip it on the parchment paper. 4. Remove the parchment paper and sprinkle some sugar mixture evenly. 5. Cut into small pieces with greased pizza wheel. 6. Toss the pieces in sugar mixture and place it on the cooling rack. 7. Let the coated jellies are rest for about 8 hours, until the outer coating become hard and crunchy. 8. Store it at cold room temperature in an air tight container for upto a week. You make them look so easy! Kudos for this post! So much effort to present this recipe! 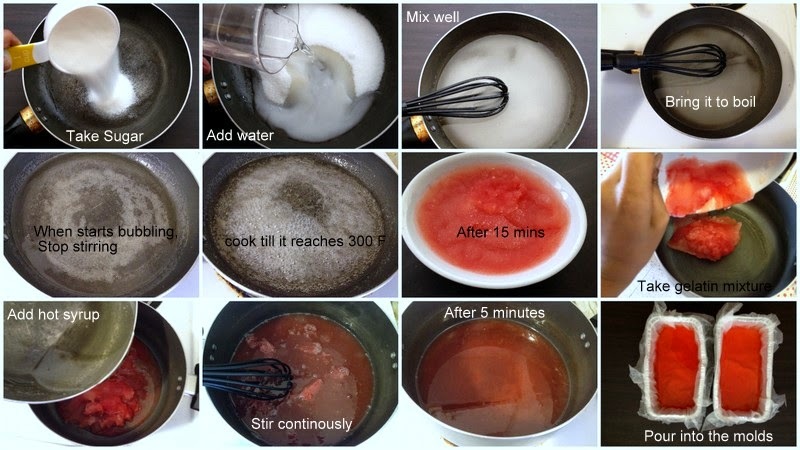 Its my fav too Anita :) It is not so difficult to make.. give a try and enjoy it..